Snap a selfie or recruit a photographer to capture your spirt in front of the multi-hued Biscuit Paint Wall, on the side of the Montrose home goods and decor store Biscuit Home. Painted by French, Houston-based artist Sebastien “Mr. 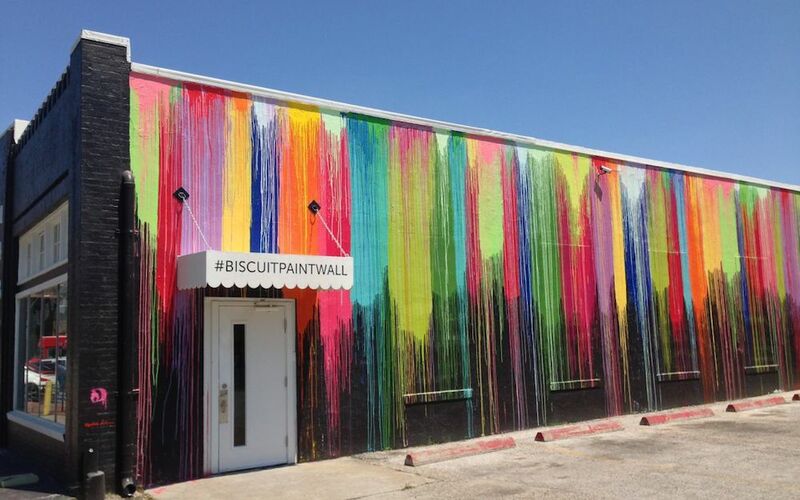 D” Boileau of Eyeful Design, the Biscuit Paint Wall debuted in Montrose in May 2014 when Biscuit Home relocated to Houston’s most creative zip from Upper Kirby. The crisp, fresh and clever design store took over the former site of B.J.Oldies Antiques and the store owners commissioned Boileau to create something that was appropriately fun and reflective of their personality in their store’s new, expanded home. Starting with a blank black canvas, which matches the more traditional black storefront around the corner, the Biscuit Paint Wall comes alive thanks to the many buckets of colorful paint that were artfully poured along the top of the wall. It’s part design, part organic. And it looks great. Clearly, the wall was clearly meant to be photographed and shared on social media. And it’s just fun to oblige. Click here to learn more about Sebastien “Mr. D” Boileau and his painting and mural company Eyeful Art. The wall is accessible at all hours. It’s located alongside Biscuit Home’s parking lot, so if you’re looking for a shot without cars in it, you’re best off trying to visit mid-morning or better yet mid-afternoon on a weekday, when the store is likely to be a little slower. Biscuit Home is closed on Sundays, however Montrose itself remains popular for shopping and entertainment and the lot can still be busy on some days. As with the “Houston is Inspired” mural by Market Square Park, Sunday evening is often a good time to try to catch the lot clear or mostly clear. If you time it correctly on a clear day, you’ll also enjoy the bonus of the soft evening sunlight casting a pink glow over the area. Biscuit Home is no stranger to Inner Loop living. The store opened in October 2012 its smaller, original location in the historic Avalon Center in Upper Kirby. The retail store was an extension of co-founder Bailey McCarthy’s decorating business and co-founder Isabel Wilson’s textile design experience. The Montrose store was conceived as a space to celebrate Biscuit’s eponymous bedding line as well as complementary furniture, home accessories and art. 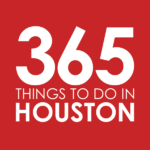 You’ll also find home accents with a Houston twist, such as an eclectic selection of books about Houston culture, history and scenery. Click here to learn more about Biscuit Home. 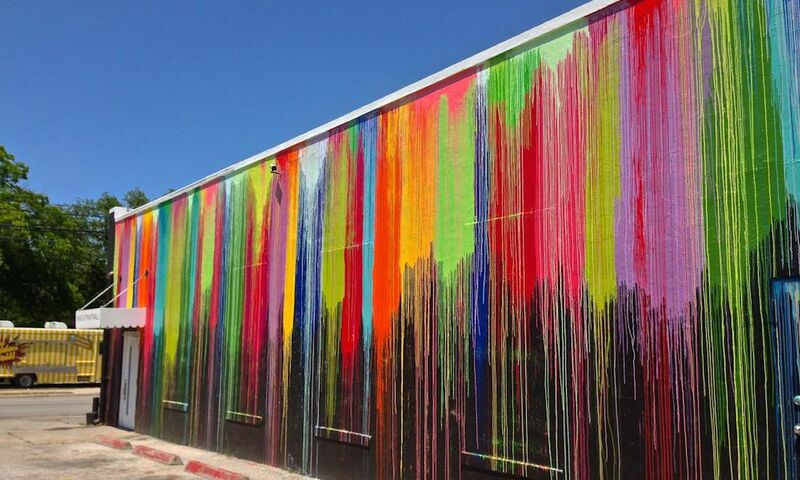 Sadly, the Biscuit Paint Wall was tagged by vandals early yesterday morning, Thursday, May 22. For the time being, it’s far from wearing its best face. However, Biscuit Home’s owner plans to restore it. We’ll update this post when that occurs. We’re very pleased to report that the Biscuit Paint Wall has been restored to its original glory!